Twenty-five years after "Citizen Kane," Orson Welles turned out a different kind of masterpiece. It was his own favorite of his movies, and it may be mine, too. Clearly a low-budget film, it sparkles and amazes. It still has the maverick spirit that "Citizen Kane" had, but this time Hollywood was not involved -- which is too bad, actually, because the film really could have been a more recognized classic if it had a little more money for the professional soundtrack that Welles was capable of. 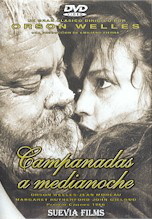 In "Chimes at Midnight," Welles plays Falstaff, one of William Shakespeare's most interesting and enduring characters. Welles called him "perhaps the only purely good character Shakespeare ever wrote." Falstaff appeared in five different plays; with young Prince Hal in "Henry IV" Parts 1 and 2, and "Richard II," as well as in "Henry V" and "The Merry Wives of Windsor." And here his scenes from these five plays are very cleverly interwoven by Welles to create the complete story of Falstaff. It may be Welles' greatest performance in a career of many great characters. Even with the limited budget, Welles managed to cast Sir John Gielgud as Henry IV, Jeanne Moreau as Doll Tearsheet, and Sir Ralph Richardson as the narrator. "Chimes at Midnight" has not been officially released on video in the U.S. It's available on second-class videotapes, but you really have to hunt for them. It deserves a nice DVD release, or even a restoration and theatrical re-release. Shakespeare enthusiasts might balk at the idea of having the beloved dialogue so mutilated, but my advice is: read the plays so that you're familiar with the dialogue, then see this film. It may be the finest example of Shakespeare on film, and certainly one of the greatest films ever made. But "Chimes at Midnight" can be acquired in a Region 0, PAL DVD as an import. Yes, it's playable in any region of the world, but Americans still need an PAL-to-NTSC converter. It's not superb quality, but then the film itself never was, and this is certainly the best condition I've ever seen it in. The image comes letterboxed (1.85:1) with an optional Spanish language track and optional English and Spanish subtitles, though I noticed that the English subtitles don't exactly follow what's being said. I've seen this DVD sell on the Internet for as much as $35, but Xploited Cinema has it for about half that.